Until September 18, 2012, the song "Gangnam Style" MV by the South Korea singer Psy exceeded 200 million views on YouTube. It has been highly praised for its humor, catchy rhythm, as well as PSY's unusual dance moves.And it also ranks first at mnet、ollehmusic、bugs、monkey3、soribada.I think this is because we are touched by the Horse-style dance and deep infectious rhythm of the music, which is full of joy.Now Gangnam Style moves to android smartphone. Let’s continue our joy on this humorous event. You can find all the sounds from this popular korean song.You are likely to set any sound as ringtone, alarm or notification very easily. It just needs to tap for 2 seconds on the desired sound and a popup will appear where you can choose.Then wait the ringtone to make a sound when call is coming or alarm in on the set time! Since it’s so popular and funny, do you want to learn this horse style dance? It will be cool to make a performance at the close friends party or the family together.It can be a good way to make the people you love laugh. This app is a Gangnam Style Horse Dance Excellent Guide, now catch it and learn it. 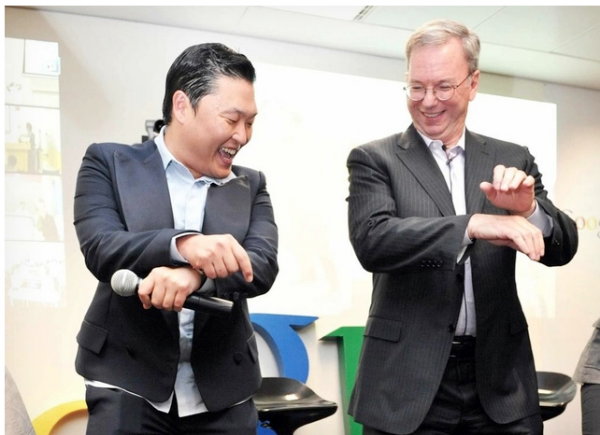 How about our Mr android robot dance in the Gangnam Style? With its green body, a pair of black glasses in different situations, it starts to move its body.After watch it,I am sure you will totally be overjoy,it can’t be funny like this any more! 4 Do you remember the pigs in the angry bird game. Now they also start to imitate Psy to dance in its Piggie Style.